The most important aspect of any new plan is understanding what you have to start out with. What are your assets? What is the starting point? Increasingly, companies are using the “reality capture” component of 3D scanning as the important first step in answering those questions. 3D scanning involves the use of a rotating laser that takes millions of measurements in mere minutes, delivering highly detailed 3D documentation. 3D images of complex environments and geometries can be generated with remarkable clarity in a fraction of the time it would take to perform the same work manually. While this technology is improving the workflow in multiple sectors, possibly the most significant benefits can be realized in the 3D modeling of process plants and factories. 3D scanning produces a high definition, three-dimensional, photographic quality image of whatever space you’re scanning. Those scans can then be applied to a multitude of tasks that can provide incredible value in the industrial environment. Imagine being able to view and walk through your entire facility on a PC. You can see every nuance of that space, from the smallest signs on equipment to the broken glass in a window. You can measure clearances, aisle ways, ceiling heights and equipment skids. You can determine the size of columns and the capacities of tanks. Now imagine doing all of this from the comfort of a conference room table, where all “the powers that be” are seated comfortably, all seeing the same images, all being able to communicate their ideas effectively, away from the noise and distractions of the “actual” space. 3D scanning is taking project planning to new levels of efficiency. Reality capture is driving down the cost of projects in one of the most amazing value plays in industry today. Having a 3D scan of a space eliminates the MAJORITY of the prime factors leading to cost overruns. The scan generates an exact image of the space. No stone is left unturned, no measurement is left untaken. There can be no excuse of unexpected conditions. Measurements are so accurate, more welding and fitting can be done in the shop. Pipe can be routed accurately through the tightest of openings. Interferences are detected well before they ever become a problem. Projects can finally come in on or under budget. 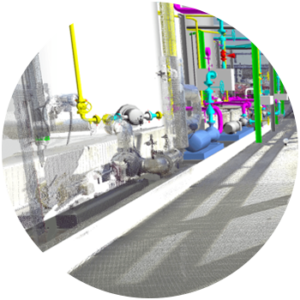 Reality capture via 3D scanning can provide quantifiable cost reductions in planning and project management. However, the real value may be in its affordability. For all of the advantages it can provide, the cost is remarkably low.